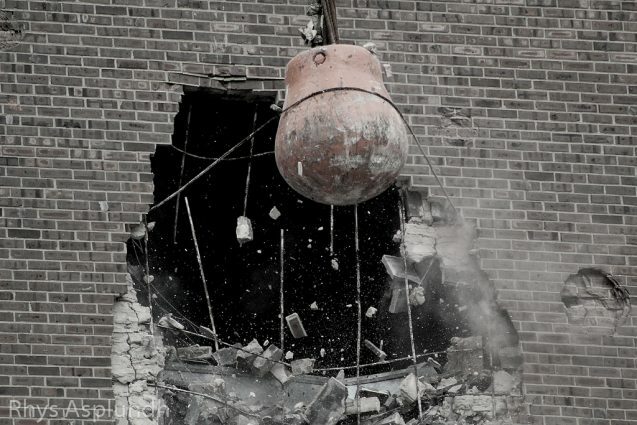 One of the most solid, longest standing brick walls in my personal genealogy research has come down this week. This wall has stood since I started researching my family in 1999, though I didn’t heavily pursue it until a bit later. I now have the names of my paternal 3rd-great-grandparents on my Zalewski line. Meet Michael & Anna (Muschowska) Zalewski. The path to breaking down this wall started as a lot of them do, just doing random searching and browsing. I occasionally visit most of the sites on my “Genealogy Community” link list on the sidebar. I almost always visit Al’s site at Al’s Polish-American Genealogy. I know Al personally since we used to attend a local Polish research group for a few years. 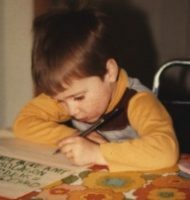 Al works very deep in Polish records and blogs in detail about what he found and how he found it. He had a post recently talking about the records he has on a specific individual and in it he mentioned a few sites he used. One of these sites was one he called the Genealogy in Archives website. I googled it and visited the only Polish one I saw. I haven’t been able to find a good description of the site, but it looks to be a program dedicated to getting Polish Civil records online from the various archives. Fortunately for me, it also includes records from the Kujawsko-Pomorskie Voivodeship including the community of Łasin where my Zalewski ancestors resided. 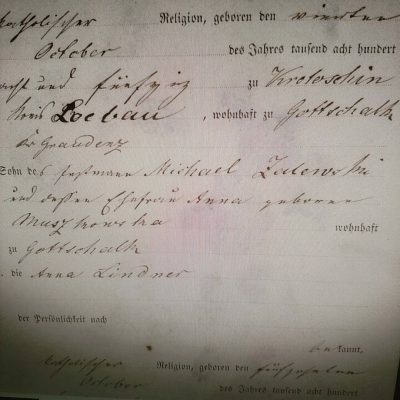 I already had the Schwenten church marriage record of my great-great-grandparents, Frank & Anna, in 1884, along with the birth records of their first three children. I wasn’t able to find the town of Święte/Schwenten in the list, so I first browsed the records for Goczałki/Gottschalk, which is where Frank resided in 1884. I searched through the year 1884 and also all of the birth record up to 1891 and found nothing for this family. I did find a few other Zalewski families (or Salewski.) 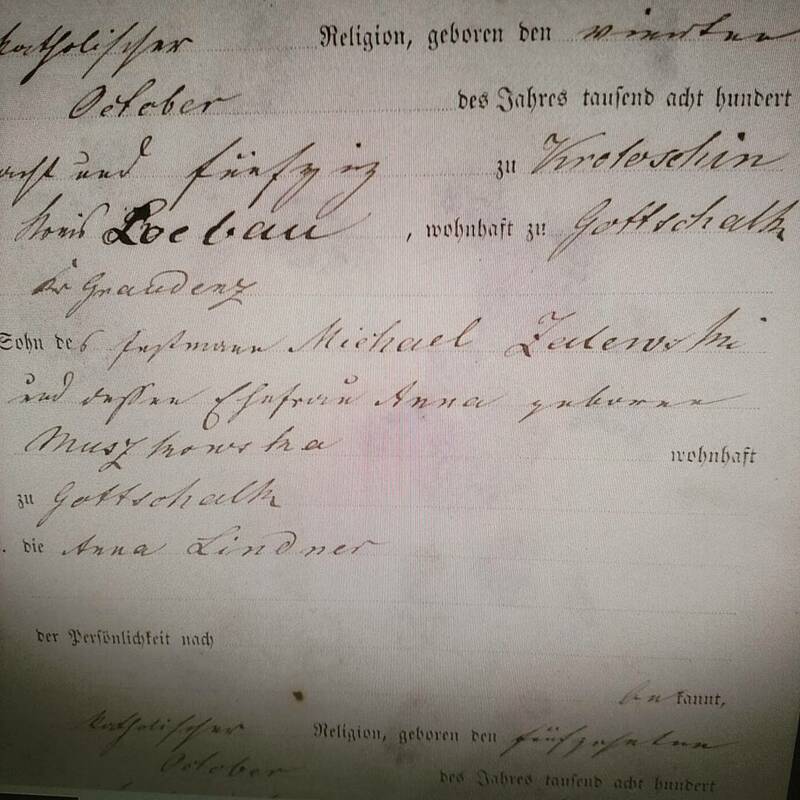 I also found the marriage record for Joseph Goralski and Marianna Gwiazdowski. Previous research points to them being somehow related to the Zalewski family, but that connection is unknown. One record says Marianna’s parents are Frank’s aunt and uncle and another record says that Marianna is Frank’s sister. I decided to ignore the brother/sister record for now and focus on the nephew one. This would make Marianna’s mother, Anna, Frank’s mom’s sister. These civil records compared to the church records also include the individuals parents, mother’s maiden name, and residence locations, so it’s a nice gold mine. It not only confirmed Marianna was August & Anna Gwiazdowski’s daughter, it gave me Anna’s maiden name as Muschewski. This may be Frank’s mother’s maiden name. I had no more luck in Gottschalk besides a few possible side relations and common surnames. I started going through nearby town records just in case when I decided to browse the whole list of towns in the Łasin community. There, right in plain view, was Święte. It didn’t show in my searches because the beginning Ś is not the standard S. I opened up the records and browsed to the 1884 Marriage records. I was literally shaking as I looked through the dozen or so in 1884 in Schwenten. Then I saw it, the husband’s name listed first, Franz Zalewski. Before even confirming the wife’s name (it was correct) my eyes shot down to the parent’s names and there they were, Michael and Anna. And Anna’s last name was Muschowska (or something similar.) Ignore the fuzzy Instagram photo I used, still processing the full versions. You may have noticed that Frank’s mother Anna Muschowska and Marianna’s mother Anna Muschewski may not be sisters since they have the same name. A few quick possibilities is that they both go by Anna but have different names or Anna remarried to Marianna’s father August after Frank’s father Michael died. This would confirm the brother/sister connection, but then it would invalidate the nephew one. Those two don’t ever really go together, one question solved, many more added. I’m still a little excited today. This was, so to speak, the Holy Grail of brick walls in my research. I may research other lines a lot of the time, but I always prioritize this line since it is both my surname line and (probably still) my shortest line. It’s also a line that no one else seems to be actively researching, so I feel like an explorer visiting uncharted territory unlike some of my other lines. As it goes in genealogy, one brick wall down and many more in the distance, but at least they’re new and untouched. That’s super, Brian! I appreciate you sharing this story as someday I may very well end up needing to research in Polish records. Thanks! I’m still processing the info and now I’m digging through records in the nearby town of Krotoschin to see if there any more Zalewskis there. If you ever need Polish/Prussian research help, feel free to ask. I feel like I’m getting much better at them.